Anti-racist activist John Graversgaard, from Aarhus, sets out campaigners’ objections to Denmark’s forced integration strategy. The recently released ‘ghetto list’ must be scrapped. It is through language that we express our understanding of reality, and it is scary what politicians are saying. Using the concept of the ‘ghetto’, and linking it to the ‘parallel society’ (ie, areas where Muslims live), the politicians have opened up a free-for-all whereby all sorts of ridiculous generalisations can be made about entire residential areas, deemed a ‘social problem’ no matter how many positive things take place there. We do not have ghettos in Denmark. What we have are multi-ethnic neighbourhoods and residential areas where people from different minority ethnic backgrounds live. This racist rhetoric is poisoning the debate. 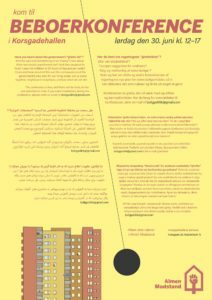 In fact, these neighbourhoods are also ones with a unique housing model based on not-for-profit housing associations ensuring democratic participation through a process whereby residents are elected to represent tenants on management committees. It is precisely such areas that are now labelled ‘parallel societies’ and ‘ghettos’ and where we see not only a harsh and discriminatory attack on citizens but privatisation of apartments, house demolitions and stricter law and order measures. Not surprisingly, accusations of social cleansing and even ethnic cleansing of these neighbourhoods, are growing. By equating multi-ethnic residential areas with parallel societies and ghettos, the government has, according to housing expert Professor Hans Skifter Andersen, created the suspicion that its programme is not about doing anything concrete to improve conditions in these areas, but is all about demonstrating its opposition to immigration. Indeed, the concept of a ‘parallel society’ is part of the Right’s struggle to stop society becoming more multicultural. In his New Year’s speech the prime minister, Lars Løkke Rasmussen (Venstre party) established the goal of dismantling the ‘ghettos’ completely, and on 1 March, the government went further, producing a new distinctive targeted strategy for ‘a Denmark without parallel societies’, promising they would be eliminated by the year 2030. Rasmussen spoke in terms of children growing up in a ‘counter-culture’ in areas where people don’t have a real job or a proper education, and where too many are reliant on welfare. In this way, the deeply reactionary debate about ‘parallel societies’ is part of an attempt to stigmatise residential neighbourhoods, starting from the deeply flawed statements that the citizens of these neighbourhoods choose exclusion, and deliberately set out to isolate themselves from the rest of society. Rasmussen must be aware that only a tiny minority of individuals living in these neighbourhoods practice a kind of conservative religious fundamentalism and seclude themselves from the rest of society. The use of the term ‘parallel societies’ to label the people of entire neighbourhoods has no justification whatsoever. In today’s politics, ‘parallel societies’ and ‘ghettos’ are words used to attack the poorest parts of our population, those who do not have a multitude of choices in terms of where to settle, but acquire their homes in neighbourhoods where property is cheapest and where they can live their lives without incurring a lifetime’s debt. The presence of a non-profit, democratically owned, housing sector in these neighbourhoods (around 500,000 apartments administered by 700 housing associations) is, as mentioned earlier, also important. Lars Løkke Rasmussen’s narrow vision demonstrates his total lack of knowledge about the areas of Denmark where many nationalities and cultures actually live together. Despite attempts to label such areas ‘Muslim enclaves’, in 2016, eighty nationalities were registered as living in the suburb Gellerup / Toveshøj in Aarhus, which is targeted for demolition. Maybe the terms ‘ghetto’ and ‘parallel societies’ work for the Danish Right because they are simplifying terms used in a political struggle to attract voters by breaking down society into ‘us’ and ‘them’ – to take the poor and the working class away from its common interests by creating enemy images. To paraphrase, these are the two main arguments that the government deploys in its struggle against the ‘parallel society’. The government wants a coherent Denmark. A Denmark based on democratic values ​​such as the rule of law, freedom, tolerance and equality and a Denmark where everyone actively participates. Over the last few decades, Denmark’s ethnic composition has changed significantly. In 1980 we were 5.1 million people in Denmark. Today we are close to 5.8 million. Growth in the population – in terms of immigrants and their descendants – comes from the outside. The vast majority of the new Danes have non-western backgrounds. Integration as a dialogue is replaced by a one-way process where you must be assimilated and adapt to Danish values ​​that are, in truth, difficult to define. We see a masked racism wrapped up in allegations of ‘the parallel society of the ghetto’ and the defence of ‘our community’. Social and economic problems in these residential areas are reduced to cultural and religious problems, especially focusing on the Muslim minorities. The Danish People’s Party, which has been a major influence, has been chief amongst those propagating the lie about ‘Muslim ghettos’. But the Social Democrats and most of the Left have a great responsibility too, for being too passive and for failing to distance themselves from this development. The Left has failed to address directly either right-wing racism or the structural racism inherent in the twenty-two proposals that make up the ‘ghetto’. Instead, it is focusing on conservative imams and women’s oppression. But these are problems that ethnic minority communities, and Muslim communities in particular, are fighting themselves. It would serve the left-wing cause much better to more strongly identify and involve themselves in the fight against Islamophobia and racism. In May 2018 a minority government, depending for its survival on support from the anti-immigration Danish People’s Party, came to an agreement with the opposition, including the Socialdemokraterne (Social Democrats) and Socialistisk Folkeparti (Socialist People’s Party), on its harsh new measures. Only the left-wing party Enhedslisten (Red-Green Alliance) is strongly against this attack on the poor and the stigmatisation of their residential areas. Let’s take a few examples from today’s Denmark to see the crossover of opinions from right to left. Prime minister Lars Løkke Rasmussen is a right-wing politician belonging to the Liberal party (free market and neoliberal) while the mayor of Aarhus, Jakob Bundsgaard, is a Social Democrat. Now, he unveils a more brutal policy approach involving state intervention. And while extremists in the anti-immigration Danish People’s Party support more governmental control against ‘parallel societies’ and the ‘religious eclipse’ as they call it, the Social Democrat Thomas Kastrup-Larsen from Aalborg says that he will not completely reject the plan, although he cautions against moving in without the support of municipalities or local institutions: ‘A ministerial hero who rides in and believes he can do it all will not be successful. This can harm local involvement and aggravate the problems’, Kastrup-Larsen told Berlingske (13 September 2017). 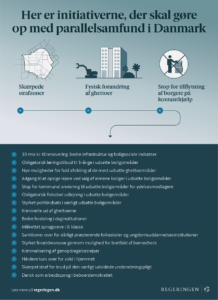 In this way, the president of Venstre is attempting to jettison one of the party’s fundamental principles, namely, that municipalities should play a decisive role in managing local conditions such as housing and education. In addition to his proposals to wipe out the ‘parallel societies’, he is also talking about the state taking direct control of schools in the listed areas. The prime minister is even more specific, saying that a parallel society can be anything from a school to a housing block, and that ‘we must identify the geographic areas and then put the whole force in action’ and that ‘the state should be able to introduce extraordinary rules that specify targets’ (JyllandsPosten, 14 September 2017). He is clear that the division of responsibility between state and municipalities must change. The problem now is twofold: how will he get the agreement of the municipalities to do this, and how will he do it without discriminating, ie, setting special rules for certain residential areas. Lawyers in several ministries are said to be working overtime! On the other hand, the prime minister is not afraid to say that his laws are aimed against Muslims. Perhaps he thinks that if the laws are aimed at Muslims, there will be no protests. ‘In certain environments, where people of Muslim and Middle-eastern backgrounds live, you identify yourself against Denmark’, he claims, adding that ‘I get a picture that these parallel societies are based on a counter-culture against Denmark.’ (Jyllands Posten, 14 September 2017). After making a reference to those ethnic minorities who are doing well, Lars Løkke emphasises that ‘We are talking about ghettos where you live in a parallel society’. In March 2016, Danish TV2 transmitted the documentary ‘The Mosques Behind the Veil’, which among other things used hidden cameras to secretly record imams and expose their views on integration as well as fundamentalist interpretations of the Koran in relation to women. The film caused a political storm and was used by politicians to advocate a hardline approach towards forced integration (assimilation). In Aarhus the Social Democrat mayor Jakob Bundsgaard decided to take action. On 31 August 2016 the city council adopted a new action plan. ‘We do not accept subversive parallel societies’, he said. The plan was linked to extremism, radicalisation, violence, honour crimes, ‘repressive and self-governing legal systems’ (ie, sharia courts), social control, anti-democratic values, social services fraud and control of associations. Again, there was no attempt whatsoever to assess the extent of these problems or to address other concerns of ethnic minorities, including poverty, unemployment and lack of democratic involvement. At the same time, the mayor put forward a proposal to close down the Integration Council, which would ensure that ethnic minorities have no democratic forum to put forward their wishes and suggestions. The other mainstream parties voted against the plan, but only because it did not go far enough! As the mayor halted plans to build a much-needed mosque in Aarhus West, where Muslims are forced to pray in small makeshift mosques and have no central place of worship, the Right began to call for the termination of housing tenure (which protects residents from eviction). And in calling for more demolitions, he even spoke of the need to reduce the presence of ethnic minorities in the neighbourhood. The mayor of Aarhus West is not as primitive in his formulations as the prime minister, but the intent is the same: to focus on so-called vulnerable residential areas and use the ghetto list to introduce special targeted measures; ever more control and management and surveillance of ‘immigrant’ communities. It is a suspicion that is made respectable through the use by Aarhus Council, in its plan against ‘parallel societies’, of the term ‘subversive of society’. Yet the real subversion comes through the state’s failure to support young people, and through discrimination, unemployment and poverty. It is well known that the mayor of Aarhus works closely with the right-wing government and its ministries on building consensus. Indeed, the government says quite openly how inspired it is by the Aarhus plan, especially the council’s policies of demolitions and reduction of non-profit family apartments. In order to ensure consensus on future legislation, Løkke Rasmussen’s plans are being discussed with top Social Democrats. Specific ministries have sent delegations to Aarhus to investigate how the plan can be implemented without giving rise to claims of discrimination and brutality. Thank you John Graversgaard for this important article, which brings to readers in English great clarity for understanding the background to recent laws and social policy in Denmark. I work in Denmark regularly, supporting teachers to welcome and integrate new arrivals to schools who are refugees and migrants. The new “ghetto list” policy will activity undermine teachers and childcare practitioners, who at a local level are developing more equal practices to improve outcomes for this group of children. The government policy is one of blatant discrimination dressed up in “liberal”clothing. Even with the use of Google Translate, once can see the intellectual poverty, the self-congratulation and use of ridiculous straw man arguments to defend policies that violate every principle and value related to rights and equalities. We have reached a new low when scrutiny of the Danish government’s policies is maligned as coming from an “identity movement” (I think that’s their proxy to attack multiculturalism), without analysing on any level at all why structural inequalities exist in Danish society. The article also says things that are blatantly untrue about the Grenfell fire tragedy in London, and further shamefully maligns the local community and activists starting their campaign for justice as starting an “identity discussion”. The article in Information.dk also has some frankly racist undertones and assumptions – that areas with a majority or higher percentage of minorities of people with a different culture are more affected by crime and unemployment because they have these population profiles. It provides no understanding whatsoever of the causes of inequality and spatial separation in Denmark. 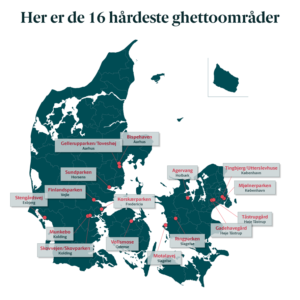 The recent New York Times article on the “ghetto list” policy has clearly touched a nerve amongst many Danes who feel that the coverage has been “unfair”. I see this as an example of the paralysis and passivity of a large section of European middle class, (well off liberals who will obviously not suffer the effects of the “ghetto list” policy), in the face of the march of the hard right and growing Islamophobia . There is no real attempt to understand context or analyse politically, and an inability to draw on core principles and finally a failure to offer solidarity and oppose injustice. There seems to be more concern that media scrutiny has been “unfair” rather than consider what the impact will be on children, families and communities labelled as ‘ghetto” areas. This is a country where more than 20% of voters in the last election voted for the openly racist and Islamophobic DF (Dansk Folkeparti; Danish People’s Party). It’s the complete failure of empathy also that I find so shocking. Thank you for a great analysis. I am so happy to have come across you and your other article of Danmarks Statistisk use of ethnicity “Statistik, etnicitet og racisme – Diversiteten og arbejderklassen som forsvandt”. I grew up in this country and my children were born here, yet we will always be regarded as an “other” in policy making and statistics. I am an economist and I know how powerful statistics can be in misinformation campaigns and anti immigrant mass hysteria and public policy. Thanks I. A. for your support. You can contact me on Messenger. I am working more on this important issue about statistics and racism.